How would a ship defend against a sea creature, and possibly win? I have a Viking-inspired race living on a harsh ocean based planet with very rough and cold seas. In these seas there are giant creatures, not unlike kraken who frequently attack ships. I was thinking long and hard without an answer on how a ship (e.g. Viking longship ) could possibly defend itself against one of these creatures, and win or at least drive it away. It is also important to note that a kraken would be 3-4 times the length of the ship. The ship cannot end up like a floating pile of spikes and blades. I'm looking for realistic weapons, tools or design features. I just wrote a big post about naval architecture principles, much of which applies here as well. To minimize the chance your ship rolls, attach a heavy keep to the bottom of it. 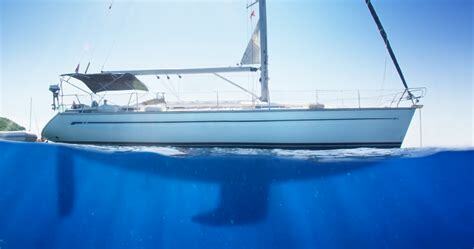 In the picture above, the sailboat has a lead-weighted keel underneath the hull; this drops the center of gravity nearly to the bottom of the main hull. As a result, this 44 foot sailboat has three times the metacentric height of a Viking longship, and is correspondingly more stable. Remember, a kraken doesn't have anything to push against in the water. It will be quite a challenge to roll over a boat weighted in such a way; at least challenging enough the the Vikings can mount and attack while the creature is trying to attack. 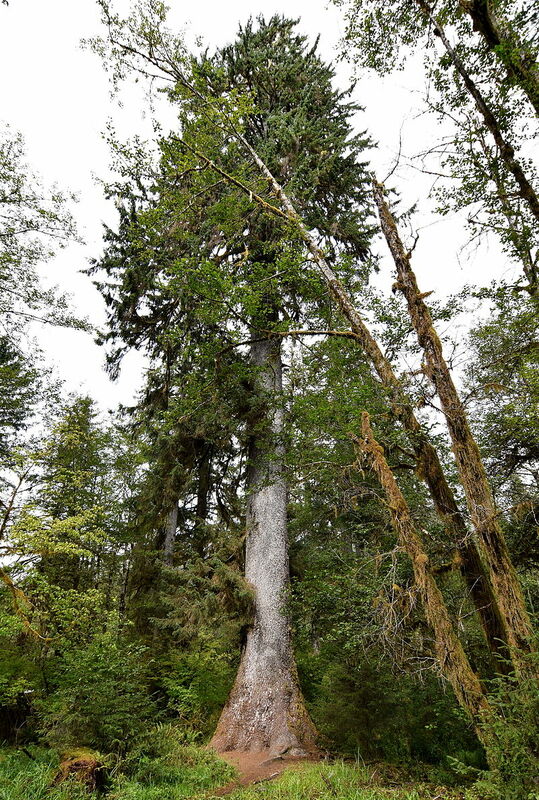 The Sitka spruce grows in the very Viking-like climate of Alaska and British Columbia, and also grows to almost 100 meters. The Pacific northwest also has a variety of other very tall trees. Make the hull elements of your ship out of a few, full length boards from very tall trees. 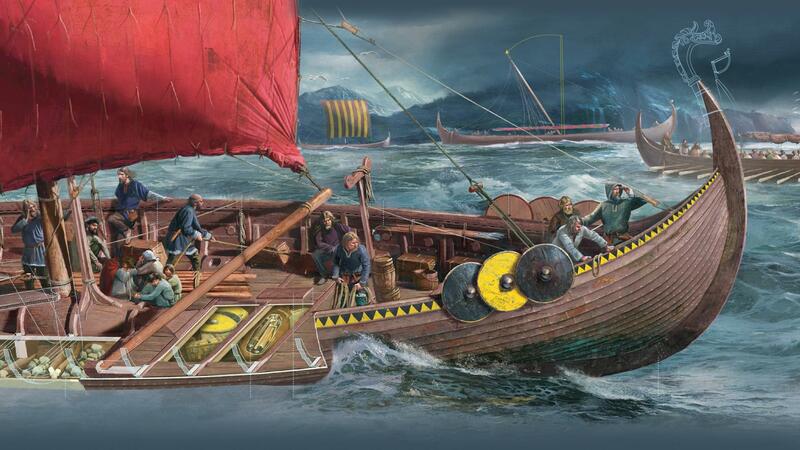 Certainly no Viking longship was ever 100 meters and the various longship types were rarely over 40 meters. Having solid pieces running the length of the ship will make it very hard to snap in half. On the other hand, a bending attack will cause a lot of leaking; so the crew, once the kraken is repelled, will need to keep plenty of tar and hemp on hand to patch holes between boards. Instead of having crew on the deck, have them below decks, rowing. 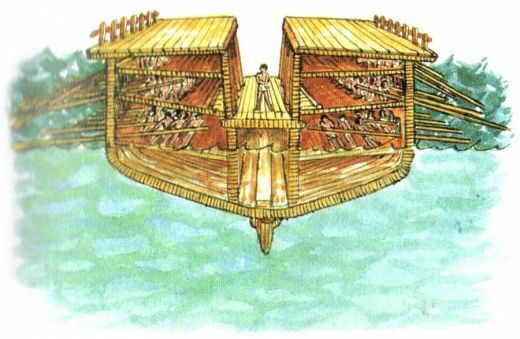 This is how a Greek trireme (pictured) operated. This will allow your crew to continue powering the ship while under attack, while minimizing the damage from the sea creature. Ultimately, animals are animals. They have a keen sense of self-preservation and rarely press the attack if they are in danger of damage. Make the ship a hardened target, with the ways shown, so that it takes minutes of effort for a sea creature to damage it. Then lead a swift counter attack; hacking at limbs and appendages, shooting arrows or ballistae at vulnerable parts, etc. The attacking creature will give up soon. If your kraken is basically like a giant squid, we can take a two-pronged approach to defend against all of your attack methods. First we want to prevent the kraken from grabbing hold of your ship to be able to rip it apart or roll it. Since the main force involved here is suction, we will cover the hull of your ship with metal plating with small holes drilled out of it. If we put a small gap between this and the hull of the ship, no suction can be generated, and your kraken can't grab hold. You'll probably also want a keel to help with rolling from the kraken ramming in to it. This isn't too 'viking-y' though since keels usually limit river travel. And to address the issue of crew members being swept off of the decks, we can install rails up to whatever height your crew members need to hide beneath. If necessary, we can apply the metal meshing across the top to prevent any from being snatched out of the boat. I still like the idea of a big floating pile of spikes/blades though! The most general method of defence (IE works on most leviathans and nasty beasties) that I can think of is to tow a well lit barge or two with meat tied to them behind your vessel. Ensure your own food supplies and light sources are well hidden from the water (and paint the undersides of your boat in light colours as defensive counter shading). With luck the nasties are going to attack the decoy and not you, and you can simply sever the ropes and sail off while your would be attacker is distracted. For an even more effective deterrent, stuff the barges with gunpowder and have a single soldier ready to blow the ship if it is attacked. The resulting explosion and concussive blast should dissuade all but the most tenacious attackers. This weapon has it all, fire scares "most" of the creatures of the seas (even humans) as scorched skin is a very very nasty wound. Your best bet is attaching it in a ballista, which could target 180 degrees so that it can shoot something somewhere near below your ship (you cant shoot below your ship). Or, a Galleon equipped with multiple greek fire might have a higher chance to kill the creature due to durability of the ship, and how many greek fire (acting as a flamethrower instead of a cannon) it can equip. Introducing the dual purpose mast. In our world masts of ships are either static, or they can be folded along the length of the ship. In this world, the mast are socketed in a tube that extends all the way to the bottom of the hull. The tube has an open bottom, and the mast is secured with pins that can be removed quickly, causing the mast to plummet down it's own length until it is stopped by the stopper attached to its tip. In this way, as the bottom of the mast is a sharp, ironclad point, the mast acts as a giant spike that can kill a kraken. If you are lucky. The mast will have to be much heavier than usual, which will make the ship less stable. (A trade off between stability and tactical advantage is nothing special of course, see for instance fighter jets). If you're under sail, the sails will have to be removed before the mechanism can be used. No matter how quickly you can do this, once it is done you are no longer under sail, you now pilot a rowing boat. Timing is everything: Realistically, you will only have one chance to deploy, you better time this exactly right. If you miss then by the time your sailors have hoisted the mast back in position, you might very well be too late. If you merely wound the kraken, instead of directly killing it, you have now attached your ship to a wounded animal 4 times its size. The odds of success with this method are slim of course, but small odds can be very useful from a story telling perspective. All the krakenoid attacks depend on it getting its tentacles out of the water and on to the boat. Tentacles are hydraulic mechanisms without any bones, so they are not really well adapted for work out of the water: a tentacle out of water has difficulty holding its own weight, never mind fighting. So the obvious mode of defence is to hack at the tentacles slithering around on the deck. A krakenoid that manages to grab one crewman while losing half a tentacle has made a net loss, even if it can regrow the tentacle reasonably quickly; the mass of food required to regrow must exceed the mass of lost appendages by a considerable margin. If you want to go further, consider having some anti-tentacle traps built into the gunwales. These would be V-shaped slots with sharp edges. A tentacle slithering across the gunwale will slide down the trap and get cut off. Kraken, like their smaller cousins, are traumatized by certain noises. Loud low frequency noises, such as might be made by a carnyx conveniently located inside the prow, are highly traumatic to cephalopods and the more dulcet tones and any ultrasonics remind them of the song of their natural enemies. In my studies of California Native Cultures, I was often surprised to keep coming upon plant-use references documenting "fish poisons". In widening my search, I became aware that most indigenous cultures across the Americas and indeed on all continents in the temperate areas of the world, used poisonous plants to catch fish... Most fish poisons, also called icthyotoxins or piscicides, occur in several related plant species. A variety of chemicals found in these plants will stun fish when it passes through the gills or in some cases ingested. The fish then floats to the surface for easy capture. Squid are water breathers. If a squid is in close proximity to you it is breathing the water in close proximity to you. Aboard your ship are kegs of poison you have prepared. When under attack, dump one or more into the water. Good poisons will stun water breathers. A squid grappling you might take a few seconds to let go and by the time it does it might be too intoxicated to escape. Kill it before it does. The biggest issue with a creature like the Kraken is most of the beast is actually below the water. It is like being attacked by an active iceberg. However, since it is an animal, it will react to pain and negative stimulus. The deck crew, being Vikings, will have axes, swords, long knives and spears, so can mount an active defence once tentacles start reaching deck level. A well coordinated attack with sharp objects will inflict damage and the Kraken will likely withdraw. Another possible defence, mentioned in another answer, is "Greek Fire". The composition is unknown to us, but it was apparently some sort of petroleum based product which could be sprayed on enemy ships and the water around your ship using a pump. 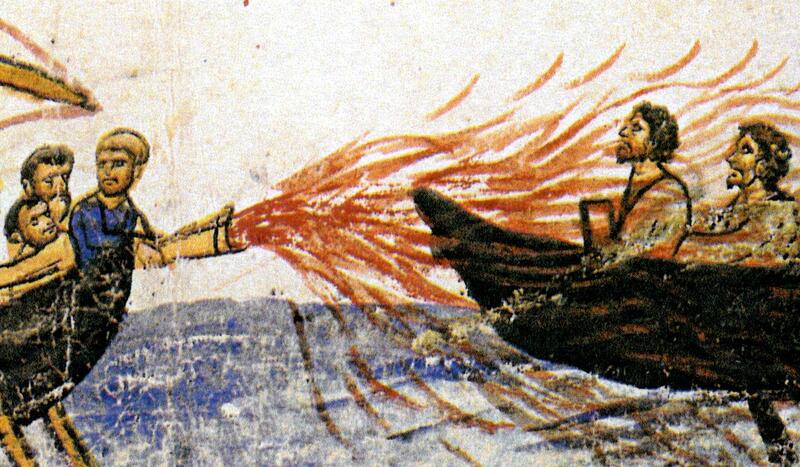 Illustrations show it projecting a flame, so it would be used much like a modern flamethrower, and it was reputedly able to burn even on water (much like a burning oil slick). So once the Kraken has been driven off by attacking the tentacles, the Greek Fire projector is used to deliver a ring of fire surrounding the boat. The Kraken will have to rise up through the flames to do a second attack, and will likely not engage once the danger is perceived. Indeed, it may retreat rapidly, since in its injured state it may well become vulnerable to attacks by the Leviathan. In order to make success more likely in this dangerous venture, the hunters may have to move out in small convoys, so if one ship is attacked, the other ships can immediately reply with sprays of Greek Fire, as well as launching harpoons below the water to try to spear the Kraken itself and inflict more damage. After a while, Krakens will learn to leave ships alone. Probably a bit advanced on the Technology front, but maybe not... A large 6-8 person rotary high pressure pump, narrowed down to a 2-3 cm nozzle would make a dandy water cannon, probably capable of cutting and debriding cephalopod flesh handily. (Squid, kraken included, are NOT notably armored.) It might not be sufficient to kill the beast, but it can put it in enough pain to make your ship an unappetizing target. This one at least you can forget about. Aquatic animals can grow to such incredible sizes because their bodies are supported by the surrounding water. Out of the water, all large aquatic animals are essentially immobilised because their bodies are not strong enough to support their own weight. A kraken may have long tentacles which would be certain death to a sailor who falls in the water, but it certainly cannot wave those tentacles in the air. Even a small octopus can barely extend its tentacles out of the water. This also is unlikely, because the kraken would need a sufficiently good hold of both ends of the boat. Tentacle suction isn't enough - it needs something to wrap round. It could perhaps creep tentacles up the side of the boat slowly, in a similar way to a caterpillar, but these would be very vulnerable to men with axes. Even if the creature has enough strength to break the ship, which seems problematic given the strength of an ocean-going vessel, it has nothing to hold onto. Now we're talking. Plenty of small boats have been lost due to whales surfacing under or near them. A heavy keel is the primary way of keeping a ship upright. If the technology (or metal) does not exist for this, or if the ship needs to be able to enter shallow waters, another possible solution is outriggers. Turning the ship into a catamaran or trimaran uses horizontal leverage and the ship's own mass to stabilise it side-to-side. Now we have something less likely to fall over, we need to take the fight to the enemy. The most likely answer is the same solution to hunting whales, namely harpoons. A large aquatic animal is only a threat if it's mobile, because it can swim faster than you can sail. It has to be close to neutrally buoyant, and nothing can swim hard enough to pull an entire ship underwater - and as I've already pointed out, the tentacles can't really reach out of the water. Once the harpoon is set, you just have to haul it in and butcher it. You could add poison to the harpooning, perhaps, but the various Inuit and Scandanavian tribes who hunted whales managed perfectly well without. This isn't without risk, of course. Whaling was a ridiculously dangerous activity - but you can easily afford to lose a couple of sailors each trip. Generally, all the mechanisms proposed are last-ditch schemes. Let's be honest: if you get to the point where the sea monster attacks you, you're done for, except for some exotic situations. What you should do is avoid such encounters by camouflaging your vessel, i.e. reducing your noise signature. Your ship can be located by the sea monster thanks to the oars whose sound resembles that of a large fish. You might switch to a different propelling system, like an Archimedes screw mounted below the deck and driven by many cranks instead of many oars. It would not give you any advantage in speed, but would hopefully make your sound unrecognizable to the creature. Alternatively, it's possible to develop techniques of sailing against the wind, and ditch the oars in favor of the sail. That would reduce your noise even further. A nice addition would be to use visual camouflage. You can paint the belly with something like the modern gray urban camouflage pattern to match the gray sky, and take advantage of what's called countershading, i.e. paint the upper part of the belly darker than the lower. Most of this has been covered already, but I'm going to post anyway. My group wasn't Viking-like at the time, but they were always worried about sea monster attacks and had the idea of a removable mast for a vessel on which the mast usually wasn't removable. The idea being that the creature probably tends to grasp the mast, so if we could remove it then that's just one less thing, right? But after the removable mast was implemented it was decided that it simply takes too long to take the mast down and so the idea was forgotten. Until the group had to hide their vessel in a cove one day and after dropping anchor Rob said, "Okay; let's get to work pulling out this stupid mast!" The other party members looked at each other in surprise and said, "Oh yeah -- we have a removable mast!" and it ultimately worked to their great advantage. Anyway, the best defense my group found against cephalopods was to use poisoned spears and harpoons. Where this probably falls down is if the cephalopod is under the magical control of another intelligence or magically bound to a place, or if the game mastering is of poor quality. c) continue to fight for an extended period of time if the opponent has any "bite" to it. Cephalopods are incredibly intelligent -- for animals. They can be very dexterous and persistent, but don't lose sight of the fact that they have only an animal-level intelligence. So, you're very unlikely to kill it because all you see are appendages, but if you inflict enough damage in a short enough period of time then it should give up and move on to easier prey. I have a special "morale-like" check I roll for unintelligent monster combat just to be self-consistent. Just throwing this out there, but kraken-like creatures are what I call "edge of the map" monsters. They're generally barrier monsters, meant to be impassible or to make you pay for getting past them. They may not fight to the death, but they should be among the most difficult to kill. In this case, the reason they're difficult to kill is because you never see them. Sperm whales are probably the largest predatory animals on Earth today. Big male sperm whales are quite possibly at least as large as the largest megaladons and prehistoric sea reptiles. If any sea life can smash boats, even as large as viking longboats, sperm whales can. In fact they have smashed or sank whale boats by rising under and capsizing them, by smashing them with their tails, by jumping on them, by ramming them, and even by biting them in half. The longboats of vikings were much longer, wider, and deeper than whaleboats. Would that have made them safe from sperm whale attacks? No. 19th century wooden sailing ships, many times sturdier than viking longboats, were damaged and even sunk by collisions with whales. There were also stories about whales smashing and sinking ships with their tails and even a story about a ship sunk after a whale jumped out of the sea and landed on the deck. And there were several times when wooded whaling ships weighing hundreds of tons were rammed and sunk by angry sperm whales in what seem to be deliberate attacks. So sperm whales could have smashed viking longboats by ramming them much easier than sinking sturdy 19th century wooden ships. They could probably also have sunk viking longboats by smashing them with their tails, capsizing them, jumping on them, and maybe even biting them in half. But as we know viking long boats made sea voyages of tens, hundreds, and sometimes even thousands of miles and usually arrived at their destinations safely - all too often for the good of those who were raided by vikings. So despite all the whales that viking long boats passed close by, there are, unfortunately, no reports of viking long boats being attacked by whales. So how did 18th and 19th century whalers attack and kill tens and hundreds of thousands of sperm whales? When a whaling ship spotted sperm whales it would lower whale boats that would row up to the unsuspecting whales and harpoon one. The harpooned whale would be attached to the boat by a long line and would eventually tire itself out trying to escape and then would be killed by an lance from the boat. The whole strategy of 18th and 19th century sperm whale hunters was based on the observation that sperm whales, though the apex predators of the sea, were mild mannered and non aggressive on the surface. If sperm whales had been aggressive toward ships and boats most attempted trans oceanic voyages, and many coastal voyages, would have ended with ships mysteriously vanishing at sea, and the Age of Exploration would have fizzled out, and the Age of Global Trade would never have started. Humans owe a lot to the nonaggression of whales in general and sperm whales in particular, and it is about time that a total worldwide ban on whaling is decreed in gratitude. So I imagine that in a world were Kraken exist, either they are almost always non aggressive toward viking long boats and ships and Kraken attacks are so rare that nobody worries about them, or else Kraken attacks are common and nobody ever dares to sail in Kraken infested seas. It would take a long of careful planning to establish a world where Kraken attacks are common enough for people to worry about them and plan how to defend against them, and yet rare enough that people have not abandoned long sea voyages in fear of Kraken attacks. The frequency of Kraken attacks would have to be on the knife's edge between too rare to worry about and so common that nobody dares to sail. Keep livestock on the boat. If the Kraken attacks, dump a cow or two overboard. Hopefully it will go for the easy meal. Bonus: If you don't encounter the Kraken, you get to eat the cows yourself. Even if ships in the convoy have no countermeasures at all, they still greatly reduce their risk because a kraken will probably only destroy one ship while the others escape. Each ship sees the same number of kraken as if it sailed individually, but has a much smaller chance of being destroyed. Another thing is that the other ships can throw ropes and rescue the crew. The Kraken might not be interested in the crew, it might only care about the ship itself. In this case, we have an economic loss but no life loss. However, 5+ ships, each with a ballista on board, could hurt a kraken enough to make it retreat. Maybe even kill it. My personal strategy would be to find some substance that chemically attacks and burns the gigantic squishy octo- some metal or mineral that was super acidic (right? a saltwater creature would be less accustomed to acid pH? I always forget which common substances are acids and bases...) Either you could put a solid substance on the hull of the boat, or just dump sacks of a irritating or toxic chemical over the side- ideally something made from hunted animals or gathered materials that took minimal processing. An excellent Viking-mindset-themed way to do it (attack more than defend) would be the above suggestions of adding spikes or blades to the surfaces of the hull. Not the answer you're looking for? Browse other questions tagged technology ships sea-creatures or ask your own question. How would rudder protection against water elementals affect ship's performance? How to defend against the “convince-me” ray gun? Would the existence of Megalodon during the medieval ages threaten Sea Travel and how to defend against them? Can spacecraft defend against antimatter weapons? How? How would an army defend itself against mass robo-snake attacks? How would a sea-dwelling species wage a war with humanoids (and possibly win)?